by S K Chatterji | Reuters – The Chinese have shown far greater alacrity in resolving disputes over land boundaries with neighbours than in drawing lines across international waters that they claim. A nation with land borders with 14 countries has settled its disputes with 10 of them, but finds it difficult to resolve its problems in the South China Sea. China’s claim lines envelop almost the entire sea. China and Vietnam already fought over the South China Sea in 1974 and 1988, and the Philippines, Brunei, Taiwan, Malaysia and Indonesia are also vocal about what they say are Chinese transgressions into their waters. The South China Sea is enviable maritime real estate. Through it run sea lanes that provide passage for more than half the world’s oil tanker traffic. Its hydrocarbon and mineral resources reportedly are substantial. Fishing rights also are essential for every country in the region. The countries that dispute China’s claims are not on a par with Beijing’s military might and some of them are looking to the United States for help — including the Philippines and Vietnam. Notwithstanding Chinese pressures that kept the last ASEAN summit from issuing a joint communiqué, most ASEAN countries, barring Cambodia and Laos, lean more toward the United States. India, Japan and the United States are now taking a closer look. Some ASEAN nations, especially Vietnam and Philippines have urged India to show greater interest in the area. Joint exploration activities with non-regional partners could prompt more regional intervention. China has significant business interests with its South China Sea contestants. It is the kind of case in which the rational needs of business should help fix political boundary disputes, but that has not happened in this case. Meanwhile, the ASEAN nations have not been able to take a common stance, primarily because they fear economic distress should China penalise them economically. Such measures could be varied. Chinese economic tools could attempt to instigate citizens of the targeted country against their own governments, thus creating domestic political pressure. China has also invested heavily in these countries and they could experience deceleration should the Chinese reduce investments. However, it would not be prudent to give undue weightage to possible arm-twisting by China. Chinese economic relations are bilateral, and retaliations, especially if these are coordinated, would cause them concern. India’s shores don’t touch the South China Sea, but it must pay attention to how the problem works itself out. China occupies 30,000 square kilometres of land in Aksai Chin that India considers its own. China also claims almost the entirety of Arunachal Pradesh in India’s extreme northeast. A China sea victory would embolden Beijing along the India-Tibet border. Notwithstanding the stated neutrality of the Americans, there is reason for concern that should the South China Sea start to simmer, it would be difficult for the situation to remain a regional confrontation. Of course, the nations involved in the South China Sea imbroglio have responsible governments, and hopefully, the new Chinese leadership will also prove its dexterity more in diplomacy rather than coercion. The sea lanes must remain open for global shipping, irrespective of national interests. Natural resources must remain open to more than one nation. To allow a different outcome will muddy the waters not just of southeast Asia but also those of the Himalayan lakes and glaciers. That would be a result that would satisfy no one. The Economist – EVEN the most ardent supporters of the Association of South-East Asian Nations (ASEAN) concede that last year was a pretty disastrous one for the ten-country grouping. Replacing the region’s usual mild-mannered consensus was an unprecedented eruption of rowing and bickering, all on very public and humiliating display at its summit meetings. The root of it all was the dispute over China’s territorial claims in the South China Sea. Cambodia, closest to China in the grouping and the ASEAN chairman in 2012, tried to press its ally’s claims. This provoked a heated reaction from some of ASEAN’s own members, notably Vietnam and the Philippines, with claims of their own. For several weeks last year the Philippine navy was involved in a tense stand-off with Chinese ships near the disputed Scarborough shoal. All the politicking over the South China Sea has diverted political energy from ASEAN’s most pressing internal task, which is to form a new EU-like economic community by 2015. At the same time, the United States last year deepened its strategic ties with Vietnam, the Philippines, Singapore and Indonesia as part of an “Asia pivot”. All this has stoked fears that, in an era of rising great-power rivalry, ASEAN might not be able to stick together. Getting ASEAN back on track will be hard, and much of the burden for doing so now falls on tiny Brunei. The oil-rich sultanate, a dot on the coast of Borneo, is home to just 400,000 out of ASEAN’s population of 600m. Brunei has taken over ASEAN’s annual rotating chairmanship from Cambodia and will host this year’s summits. At the same time, the organisation has acquired a new secretary-general. Le Luong Minh, a Vietnamese former diplomat, has succeeded Thailand’s Surin Pitsuwan. That the baton should pass to ASEAN’s smallest member at this moment of almost existential crisis has caused concern for some. Brunei has only 30-odd people working on the ASEAN brief in its foreign ministry. And next year it will be followed as chairman by the wholly untested and still controversial Myanmar. Yet Lim Jock Seng, Brunei’s deputy minister for foreign affairs, argues that these anxieties are misplaced. 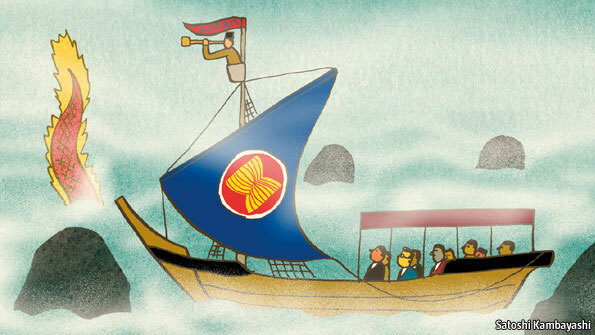 For a start, apparent shortcomings can be turned to ASEAN’s advantage. Brunei may be small, he says, but that also makes the country relatively unthreatening, especially to China. Had the chair passed to Vietnam or the Philippines at this point, all hell might have broken loose. Although Brunei is also a country with an interest in the South China Sea that China contests, its claim is the smallest—just one submerged reef. Last, being extremely rich puts Brunei in the happy position of being free of a financial reason to kowtow to China—or anyone for that matter. That was Cambodia’s undoing last year, and could yet be Myanmar’s next. Mr Lim believes that Brunei’s relative obscurity should help it practise the “quiet diplomacy” that everyone agrees is needed to repair the breach with China. He has already been to Beijing to talk to Chinese officials and says that both sides agree that the ASEAN-China relationship is “bigger than the South China Sea issue”. Opportunities for joint economic development ought really to trump it. The main sticking-point is that although ASEAN is keen to implement a “code of conduct” covering the South China Sea disputes, China refuses to acknowledge a collective position. Instead, it prefers bilateral negotiations with each claimant country. Mr Lim, however, hopes to start talks with China on the code of conduct and to have something “concrete that we can sign” by the main ASEAN summit in October. If so, that would be a coup, especially if China’s new leader, Xi Jinping, does not signal a softer line in the meantime. Vietnam’s Mr Minh will have much to do as secretary-general. His country is overtly suspicious of Chinese intentions, and he might face pressure to tilt the group further against China. Until now, however, he has been impeccably diplomatic. He will probably focus on completing the ASEAN economic community, which is exactly what most of ASEAN wants him to do—so long as Brunei can successfully steer the grouping away from the diplomatic reefs of the South China Sea.